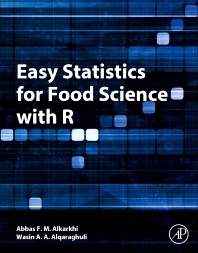 Easy Statistics for Food Science with R presents the application of statistical techniques to assist students and researchers who work in food science and food engineering in choosing the appropriate statistical technique. The book focuses on the use of univariate and multivariate statistical methods in the field of food science. The techniques are presented in a simplified form without relying on complex mathematical proofs. This book was written to help researchers from different fields to analyze their data and make valid decisions. The development of modern statistical packages makes the analysis of data easier than before. The book focuses on the application of statistics and correct methods for the analysis and interpretation of data. R statistical software is used throughout the book to analyze the data. Abbas F. M. Alkarkhi received his Ph.D in applied statistics from University of Science, Malaysia (2002). He received his BSc and MSc in statistics from Baghdad University in 1985 and 1992 respectively. Dr. Alkarkhi spent fourteen years as a faculty member in the school of Industrial Technology at University of Science Malaysia (2002-2016), then moved to Kuala Lumpur University- (MICET campus) in the technical foundation section. Prior to joining a Ph.D study, he worked in Iraq for two years and in Libya for five years as a lecturer. He have been published more than 80 papers in national and international journals, a text book, titled “Elementary statistics for Technologist,” and chapters in other publications. Dr. Alkarkhi’s research focuses on the applications of experimental design and multivariate analysis. Dr. Alqaraghuli received her BSc and MSc in statistics from Al-Mustansirya University. She worked at a specialized institute for engineering industries in Iraq, and during this time, she conducted training in statistical methods. She also worked at the University level in Iraq, Jordan and then Libya after receiving her MSc in statistics. In 2014, Dr. Alqaraghuli received her Ph.D from the school of mathematical sciences at the University of Science, Malaysia. Dr. Alqaraghuli’s research is focused on the application of experimental design, modeling, and multivariate. She is currently self-employed and conducts workshops for non-statisticians while also conducting research.